My PA trip is still going strong. Departing from the Amish schedule for a bit, I took a day trip to New York City yesterday. The only Amish I saw were on the Amtrak ride home to Lancaster, though. And they didn’t have any buggy along that I could see. I wonder if that sign is for the carriages in and around Central Park??? Yes, that’s definitely for the carriage rides near Central Park! That’s cool that you saw some Amish on the Amtrak, though! Nice photo, Erik! Erik, I’m glad you are in the States to travel around and take pictures! Yes, cool photo. The Central Park horse carriages actually don’t look like Amish buggies; the NYC ones are open carriages and usually white in color. 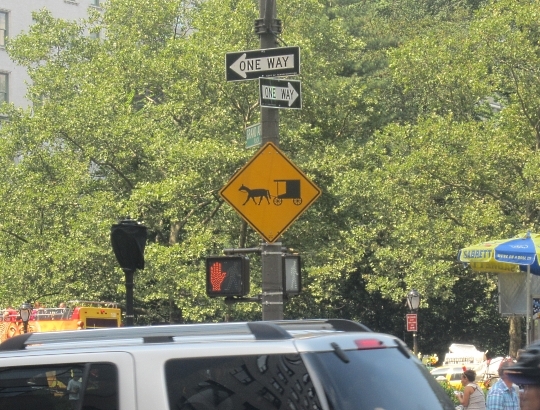 Still, fun to see an Amish buggy sign in NYC. They’d have to be pretty fancy Amish to get away with driving some of these beautiful city carriages, wouldn’t they. Krakow, PL has a lot of these tourist carriages as well. And they must cost a mint, I have no numbers but based on the craftsmanship I wouldn’t be surprised if some were more than a new motor vehicle. I would imagine that the State of New York made a standard issue sign for everyone, rural and city alike. In anyone’s travels and conversations with Amish friends, has anyone been told about Amish visiting the Big Apple to play tourist, or any other major US city? On Sunday I spoke to an Amish man who worked in a market, I believe it was in Manhattan, for a time. I don’t think it was a strictly PA Dutch/Amish market though. Shom, I know of Amish visiting San Diego, California. It’s actually Federal (adopted nearly universally as-is by each state; a few states do make some minor changes, usually over the shape of state route markers). The “Manual of Uniform Traffic Control Devices” sign W11-14. For better or worse…because it means NY state or city isn’t supposed to make up a sign that’s better for their own situation (like showing an open cab hack), but use one of the standard designs. It’s mostly good, but being it’s pretty dense and bureaucratic engineerese, I’ve also run into a few situations because of it’s adoption by other agencies (i.e. OSHA will look that highway workers — including fire and police — are following it as well) that it contributes to driver confusion and being less efficient setting up safety zones. Thanks, I didn’t know what jurisdiction that fell under in the USA, thanks for letting me know. Didn’t you hear, they are filming another Amish in the city series. On a serious note to answer slightly handled order man, Yes I have have traded tourist stories about NYC with some Amish acquaintances. In fact the Amish seem to enjoy NYC much more than I do. There are non-Amish horse drawn carriages in Manhattan. I think it is supposed to be something charming for the tourists. The ASPCA calls it cruelty to animals and is trying to put a stop to it. Through a couple of visits to Lancaster County, we have made friends with an Amish couple. When we were there in June they mentioned a trip they and some friends made to Washington DC a few years ago. When they arrived, they really didn’t know how to get around. A man with a van offered to drive them around and show them the sights for a set fee. Sounds like a set-up for taking advantage of folks, right? But he did an excellent job of ferrying them around town, knowing when to arrive at certain spots to get the most out of their visit. They had a very enjoyable visit — but definitely weren’t interested in moving there! I am from New York and would like to visit Lancastor county. I don’t drive so I would be taking the Amtrak. Does anyone have any advice on how to get around from the amtrak station to Amish country and where to stay? Have fun, Erik, and keep those photos coming!